I’ve been playing lots of board games on the iPhone. Many of the old family favourites are on there, normally produced by EA, and accurately represented; but, let’s face it, the mechanics of most of those are highly simple or broken in key ways. Y’know, Connect 4 is solved (perfect play, even on both sides, still results in the first player winning); Monopoly rewards people who buy every square they land on and focus on developing the highest probability tiles; and the Game of Life is mainly determined by luck in what cards you pick. An early, excellent conversion; I’m told the iPad version is almost as excellent as Small World iPad, which is one of the best games I’ve ever played. Taking the classic Settlers of Catan, where you gather resources and build a small range of structures, and turning it into an extremely simple but hugely flexible iPhone game is no mean feat – making it as accurate and attractive as this, is even better. I actually used this as a training tool (alongside the similarly excellent 360 version) when I won this year’s Catan tournament at Develop. Sadly, there’s no internet-based multiplayer. An excellent conversion of one of the best German board games; you build a Medieval world gaining points by varied deployment of a limited supply of workers. 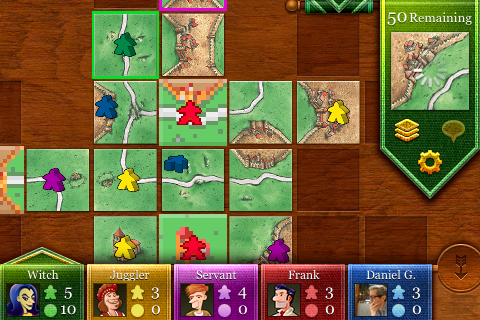 It comes with a very solid solitaire mode, for singleplayer types, but is mainly designed to be played in multiplayer, which can be either local (with the varied AI or with friends) or internet-based. It’s a faithfully beautiful conversion, with a charismatic tutorial and rapid play, that demonstrates exactly how board games should be converted. Also includes weekly challenges, online leaderboards and the rest. Unlike the other titles, this is distinctly Ameritrash. 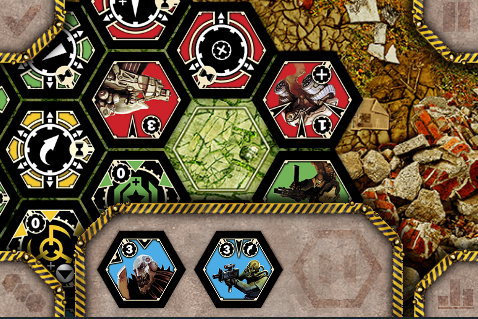 Four distinct factions (AI, mutants, military, guerillas) battle over a small hex-based battlefield; different special abilities, ranges and attack types distinguish each unit and theme of each side, and units and buffs are distributed randomly to each player at the beginning of a turn. I’ve not played the board game, but this is a distinctly different creation from the previous two reviews: where they’re pastel shades, it’s coloured brutally; where they’re pacifistic, it’s bloody; where Catan is mechanics-oriented, there’s an unmanageability to the randomness here (and in Carcassone, to be fair), so the skill is building a strategy on the fly from the outcome of your random cards, rather than making a long-term plan based on the set-up of the board . It’s still good fun and great with friends, but not as free-flowing as a Games Workshop/Fantasy Flight title or quite as evocative. Like Robert Florence, I love Ameritrash. I’ve got on with Knizia’s games in the past, but am aware that they’re more mathematical puzzles than malleable games where you struggle against other players. That said, possibly because of their maths base, they’ve proved easy to convert to the iPhone and relatively popular. If you’re a fan, the following are all on the iPhone – I’m not going to try to review them, as I don’t fancy spending £50 of my own money confirming my suspicion I don’t like them: Ra, Robot Master, Ingenious, Topas, Money, Monumental, Roto, Knights of Charlemagne, Poison, High Society, Samurai, Keltis, Kingdoms, Medici … and loads more. These are polished games, with great multiplayer integration and polish – but, sadly, they’re either highly random, simplistic or solved. To a lover of games, they’ll be ultimately unsatisfying. The Game of Life, Monopoly, Trivial Pursuit, Connect 4, Cluedo, Uno, Pass the Pigs. Previous Post Previous post: The 360-Degree View: Documentaries.